I found a "rare" coin in my change! What is it worth? I get asked this question numerous times everyday, so have produced a handy guide picture to help out with a value on your coin. If the coin you have is not shown here then please assume it is only worth its face value. Do not be fooled by the prices on eBay and other sites! There are many reasons why someone would put up a common coin for sale at a silly price, sometimes this is a simple misunderstanding of its value, but occasionally its the work of proffesional fraudsters, these people will "sell" a common coin and have an accomplice "buy" it to account for large sums of money, a form of money laundering. 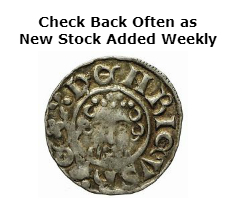 If in doubt simply select "Advanced" on eBay, check the box saying "Show Sold Listings" and search for your coin, this will give a far more accurate example of its value. Coin collecting has been around almost as long as coins themselves and is a growing and fascinating hobby, the idea that you can hold a historic work of art from lost civilizations in your hands to me is the greatest adventure within the hobby, however many choose to invest in antiques and especially coins as a great way of passing something certain to grow in value on in years to come or simply as a brilliant investment which has shown a consistently high return. There are many collecting clubs and informational websites out there for new hobbyists and seasoned pro's alike and we have some links and information about these societies and websites on our "Useful Links" page which can be seen at the top of the page. Collecting coins can be a challenging hobby with many obscure terms and abbreviations and different dealers and countries have different grades and terms. 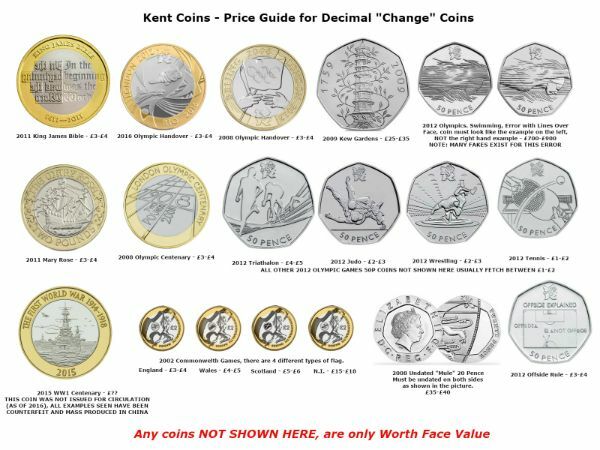 A quick description of some common coins terms used on this website and in the UK are shown below. MM = Mint Mark, a common feature on many coins. Moneyer = The name of the actual person who struck the coin, features on early hammered coins and some ancient coinage. Obverse = The side of a coin usually featuring the monarchs name or head. Reverse = The tails side of a coin. Flan = The whole piece of metal the design is struck onto. 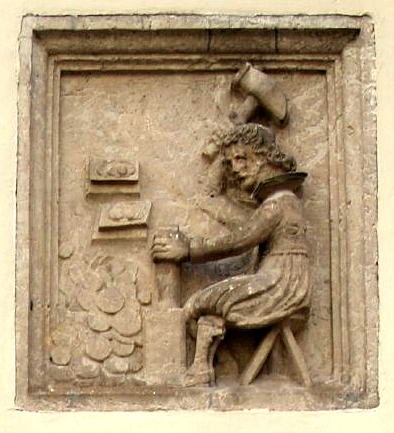 Legend = The writing or inscription on the coin. Field = The flat part of the coin between the main design and inscription or edge. Exergue = The part of the coin below the main design often containing the date. Die = The block with a design engraved onto it which presses the design into the coin. Mule = A coin featuring 2 sides which are not normally used together. Proof = Carefully struck coins from polished and treated dies, usually with a mirror like or matt surface. Hammered = Refers to the old way of creating coins by placing the blank metal between 2 dies which were then hammered by hand to create the design. Milled = Coins created from coin presses operated by hand, steam or electricity. Poor = A very worn and damaged coin, may have a lot of wear and other damage this is the lowest grade for a coin. Fair = Sometimes referred to by other dealers as VG (Very Good) grade, coins will have a lot of wear and damage but most original detail should still be visible. 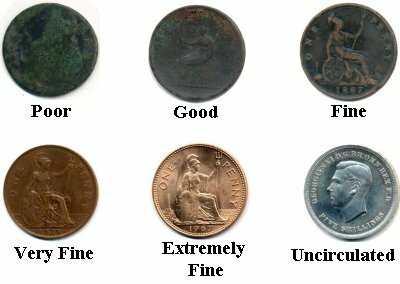 F (Fine) = Coins in Fine condition still show significant wear and/or some damage however all detail should be visible and relatively clear. VF (Very Fine) = Some wear and surface marks however all original details are still very clear, with little or no problems with the coin. EF (Extremely Fine) = Little if any wear, some surface scuffs and marks may be visible, coins in EF are top grade very collectable pieces. UNC (Uncirculated) = No wear or surface marks, a top grade coin which has not been knocked or damaged at all. FDC (Fleur de Coin) = A proof state coin with no marks or imperfections on the surface of the piece whatsoever. If a grade has an A before it (IE: AVF) this denotes the word "About" meaning the coin falls between categories for condition. Alternatively we also sometimes use a G before a grade to denote "Good" (IE: GF) if a coin falls inbetween grades. Our grading for all our coins for sale are my opinion and many collectors find condition to be in the eye of the beholder, please use any grading given on our items as a guide and view the pictures of the items to determine grade for yourself. Happy hunting and I hope this guide has been useful.